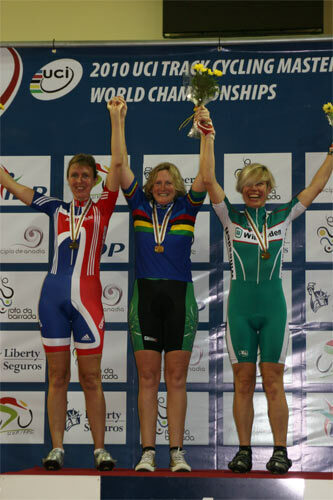 Orla Hendon ended her master�s track world championship campaign in style today, winning the women�s points race for competitors in the 45-49 year old category. She rode strongly during the 50 lap race, placing second in intermediate sprints two and four, and then picking up a further point at the end when she crossed the line in fourth place. This gave her a total of five points, level with silver medallist Elizabeth Clayton (Great Britain). 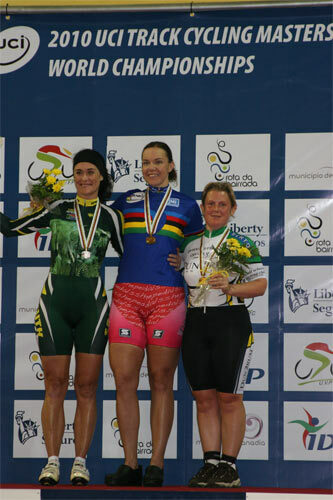 However her better placing in the final sprint (4th versus Clayton�s 6th) saw her earn the blue rainbow jersey plus the gold medal. 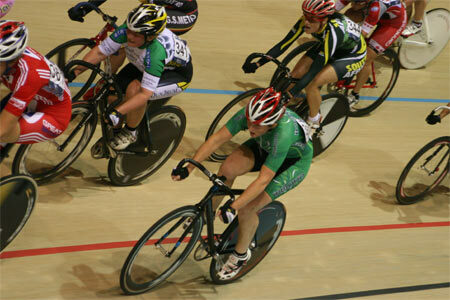 It added to the bronze medal she took on Thursday in the women�s scratch race. 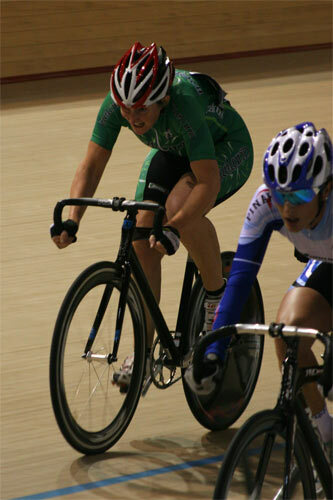 Aideen Collard competed in the same event, with her results in the sprints determining her finishing position in the 35-39 category. She took a bronze medal in the 35-39 age group, slotting in behind Dena Eaton (USA) and Amanda Wray (South Africa) and adding to the two silver and one bronze medals already achieved by her. 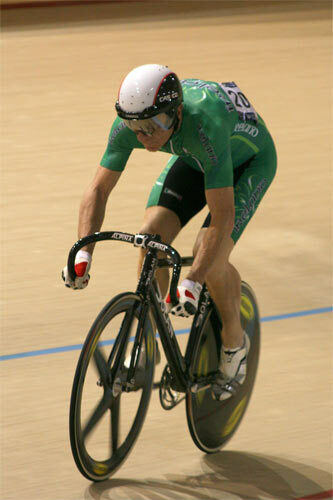 Terry Cromer competed in the men�s 55-59 points race but was fatigued from the previous days� racing and did not finish that event. �I was most satisfied with the sprint races, in that I got as far as I did with such tough competition,� he said afterwards, speaking about his overall campaign. �I beat a few more people on the way that I hadn�t in previous years. My plan now is take a year out of the Masters as there are too many strong riders � today we had the world hour record holder for his age group, as well as the rider with the world hour derny record. 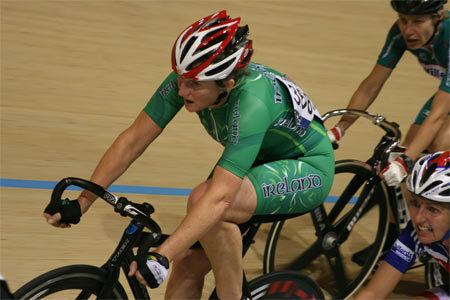 Simon Coughlan took a silver medal in the individual pursuit earlier this week, helping the Irish riders achieve a final tally of one gold, three silvers and three bronze medals. He finished his campaign on Thursday, while the other three continued until today. Collard said that she hoped the results would have a positive effect in terms of motivating others. 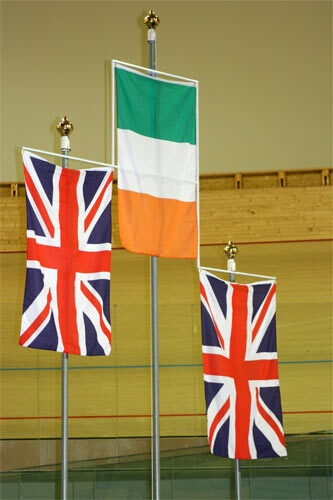 �We hope that this will encourage women from Irish cycling to compete at this level or higher in the future,� she said. The trio thanked Cycling Ireland and mechanic Ger McNamara, who drove 2000 kilometres to Portugal with equipment.